This report provides a comprehensive overview of the size of the regenerative medicine market, segmentation of the market (stem cells, tissue engineering and CAR-T therapy), key players and the vast potential of therapies that are in clinical trials. 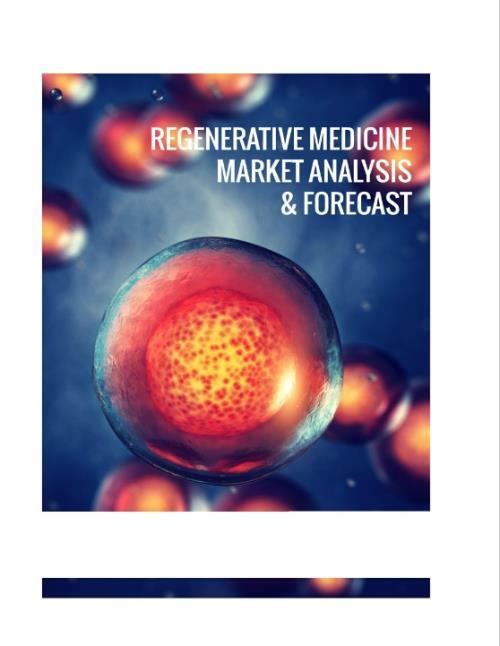 This analysis indicates that the global regenerative medicine market was worth $28 billion in 2018 and will grow to over $81 billion by 2023, with a CAGR of 23.3% between this time frame. This report describes the evolution of such a huge market in 15 chapters supported by over 350 tables and figures in 700 pages. An overview of regenerative medicine that includes: stem cells, allogenic and autogenic cells, umbilical cord blood banking, tissue engineering and CAR T therapies. Insight into the challenges faced by stakeholders, particularly about the success vs. failure ratios in developing regenerative medicine drugs and therapies. What is the global market for regenerative medicine from 2017 to 2023? What is the global market for regenerative medicine by geography, through 2023? What is the global market for regenerative medicine by indication, through 2023? What is the global market for the stem cell industry from 2017 to 2023? What is the global market for the stem cell industry by geography, through 2023? What is the global market for the stem cell industry by indication, through 2023? What disruptive technology is advancing the overall regenerative medicine market? What are the major company players in the regenerative medicine, stem cells, tissue engineering and CAR-T industries? What types of clinical trials are currently being performed by stakeholders and major players? What are the strengths, weaknesses, opportunities and threats to the market? Which geographic markets are dominating the space? What are the advantages and disadvantages of the allogenic and autologous stem cell industry? What are the main driving forces of this space? What are the main restraints of the regenerative medicine industry as a whole? What is the current environment of the global cord blood bank industry? What are the global access challenges of the regenerative medicine market? What is the space like in Japan, China, South Korea, USA and Europe? What are the main challenges associated with CAR T therapy? When will the first CAR T therapeutics be approved? What are the current regulations for immunotherapies in USA, Europe & Japan? What are the main manufacturing steps in CAR T therapy? What challenges lie ahead for CAR T production? 3.7 Why Do Stem Cell Clinical Trials Fail? 3.8 What is the Future of Stem Cell Trials? 7.1 What do Investors Want from Cell & Gene Therapy Companies? 7.2 What Makes a Good Investment? 7.3 What Types of Companies do Not Get Investment? 7.6 What Cell & Gene Companies are the Most Promising in 2018? 13.5.3 What Co-Stimulation and Activity Domain is Optimal to Use? 15.1 What has Strengthened the Industry Thus Far? 15.3 What are the Main Driving Forces of this Space? Regenerative medicine’s main objective is to heal and replace organs/cells that have been damaged by age, trauma or disease. Congenital defects can also be addressed with regenerative medicine. Therefore, it’s market encompasses dermal wounds, cardiovascular disease, specific cancer types and organ replacement. To that end, regenerative medicine is a broader field and manipulates the body’s immune system and regeneration potential to achieve its requirement. Financially speaking, investment into this space is dominated by grants, private investors and publicly traded stocks. Of course restrictions to this market include strict regulations in certain geographies, and also the level of investment required to support R&D, clinical research, trials and commercialization. Reimbursement strategies are also paramount to success of the overall space. There are over 700 regenerative medicine companies globally at present, that all together have a $x billion market cap. At present the total regenerative medicine market has more than 500 products commercialized. Reconstructive surgeries for bones and joints is the mainstay of the regenerative medicine market. Geographically speaking, due to the dominance of the bone and joint reconstruction market, the US has the biggest space. This is followed by Europe. However, due to recent positive legislation in Japan and Europe, the stem cell arena will grow more substantially in these regions over the next five years. By 2023, it is possible that Europe will surpass the US market with respect to stem cell applications, and this will become more likely if the Trump Administration restricts legislation and funding. The last few years have been busy for regeneration medicine, cellular therapeutics and the gene therapy industry, with high investment from pharma giants such as Eli Lilly, BMS, Astra Zeneca and Sanofi. Company partnerships were also in motion that included Kite Pharma and Bluebird/Five Prime, Juno and Fate Therapeutics/ Editas Medicine. One of the highlights was the $x billion, four year deal between CRISPR Technologies and Vertex which indicated that gene editing technologies are cutting edge. Today the stem cell and regenerative medicine industries are interlinked and over the last number of years have grown substantially. Regenerative medicine replaces or regenerates cells, tissues or organs and in order to achieve this uses produces from the pharmaceutical, biologics, medical device and cell therapy spaces. Therefore, cell therapy, and stem cells come under the umbrella market of regenerative medicine. Cell therapy is a platform by which regenerative medicine can achieve its aim and concentrates on using cells as therapeutics to treat disease. In 2018, the global stem cell market was worth $x billion globally, and this is set to rise to $x billion by 2023 with a CAGR of x%. Tissue engineering was the forerunner of the present regenerative medicine market. The area of biomaterials was developed to use cells and biological material and incorporate them into scaffolds and functional tissues. Some of the main applications of tissue engineered products include artificial skin and cartilage and so this area dominates the dermatology, bone and joint submarket. Wound repair is also a significant area for tissue engineering, with products such as Dermagraft in the market. The biobanking industry is made up of over 500 public and private blood banks globally. These companies and institutions collect, store and distribute adipose tissue, cord blood and birth tissues, musculoskeletal tissues, pericardium, skin, bone, vascular tissue, autologous and allogeneic cells and other biological samples. They operate by charging a collection fee and then a storage fee, which is usually operational for 20 years. Private banking costs between $1,350 to $2,300 as an initial fee, and then between $100 to $175 per annum for storage. Public banking is free, and a number of hybrid models have been introduced in Europe and Asia to date. The CAR-T industry is addressing unmet needs in specific relapsed cancers, however does early clinical trial data support a blockbuster status for this upcoming therapy? Some patients do indeed show long term activity and high remission rates, but there is a large proportion of patients with toxicities such as cytokine release syndrome and neurotoxicity. The main players within the CAR-T market are Juno Therapeutics, Kite Pharma, Novartis and Cellectis. The market is moving ahead, backed by years of R&D, from both academia and industry, investors capitol and small clinical studies. From 2017, the researcher forecasts that CAR T therapy will become more streamlined, with faster manufacturing times as advances in technologies take hold and clinical trials provide more robust evidence that this immunotherapy is robust. These factors, plus strategies to reduce adverse reactions and toxicities and larger players like Novartis taking stage will push CAR T therapy ahead. However, recent deaths in the Juno ROCKET trial are creating questions amongst investors. How will the CAR T space influence the total immunotherapy industry going forward? This comprehensive report scrutinizes the total market and provides cutting-edge insights and analysis.